Furious George (est. 1995) is an elite amateur open-division ultimate club based out of Vancouver, British Columbia. In its history, Furious has become a 10-time Canadian National Champion, 3-time UPA (now USA Ultimate) Champion and 3-time World (WUGC & WUC) Champion. The players of Furious George continue to travel the world both as a club and in the service of multiple national teams. I saw Furious George for the first time in 2003. At the time, I was sitting in the bleachers of Molson Stadium in Montreal, watching the national finals between Furious and a fairly nascent GOAT. I had learned the game only for the purposes of cross-training (under more-or-less correct rules, and gratefully under the tutelage of people who could actually throw forehand) less than a year before, and I was a terribly green player. I was playing for Ottawa’s mixed team Juce that summer (there’s no ‘I’ in ‘Juce’, was the explanation I was given, although I still find that argument somewhat unsatisfying) and I had no idea at all who Furious George was. But I knew someone who bragged that his team had scored all of six points against them, and from where I sat, I could see they possessed one very tall, authoritative-looking fellow (Andrew Lugsdin) who appeared to me to strikingly resemble the Man-with-the-Yellow-Hat. I was utterly ignorant. They defeated GOAT 17-6. It was their sixth national championship. For many ultimate players, there exists some turning point around which we begin to take the game a little more seriously – that time when we begin to draw distinctions between merely “playing ultimate” and becoming “ultimate players.” In my mind, that tournament is my reference point, around which I orient myself in the local history of the game. I was very much a latecomer to this particular story. Furious George was reaching the peak of their powerhouse decade, and the win I had just witnessed — just another stepping stone toward their second world championship in 2004. As it happens, captain and artist Khai Foo did like ‘Furious George,’ and he arrived at the next practice with a draft for the team insignia. “When he showed up with his little angry monkey logo, that’s when we knew,” Kader explains, “It was decided.” Khai Foo’s iconic logo eventually became one of the most recognizable images in ultimate: a mainstay of early Ultivillage DVDs, and the flagship for sport-specific clothing supplier GAIA. The logo turned the name of ‘Furious George’ from a tongue-in-cheek, drunken joke into a bonafide brand. In 1997, Andrew Lugsdin fully committed himself to Furious. A commanding veteran from WaX, he had freshly resettled in Vancouver in 1995, and had dabbled previously with Furious and also in the U.S. with Sockeye (of Seattle). After joining Furious for their trip to Sweden, he returned to their roster for the full ‘97 season. He was almost instantly cemented as the team leader – a role he would keep for most of the next thirteen years. The Monkey enjoyed a breakout season, winning their third national title, and a surprise bronze-medal finish in the 1997 World Ultimate Club Championships, hosted in their own hometown. By then, Lugsdin (WaX), Cruickshank (Evil Genius), Savage (Evil Genius/Altar Boys), Nichols (Vertigo) carried growing presence in the ultimate world, and they were on track toward great things. Nevertheless, there were still two other clubs in their orbit that would strongly influence the rising Monkey and forge the legend: the Nomads and the Altar Boys (aka ‘Alter Boyz/Alterboyz,’ depending on whom you ask). Naturally, both also represented Canada in 1997, finishing 17th and 15th, respectively. The Nomads(Canadian Open champions in 2001,2004, 2005, and 2008, Master’s champions in 2012) were based largely in Victoria, British Columbia, and were notable contemporaries of Vertigo, Evil Genius and WaX. They had been making regular appearances at CUCs for years among the top contenders. 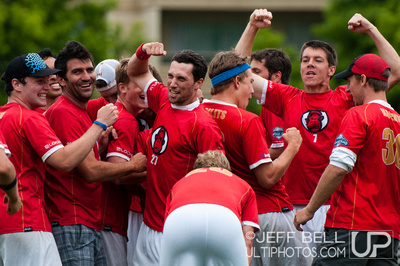 After Vancouver’s successful 1997 season, Nomads and Furious entered a longstanding symbiotic timeshare of players, and both clubs continued to exist alongside each other, taking alternating turns at CUCs (Canadian Ultimate Championships) for over ten years. This relationship was the source of such future Furious stars as Mike Enns and Evan Wood. Fittingly, the 1997 national championship pitted Furious George against the Alter Boyz in the final, but the Monkey emerged once again victorious. Grant grudgingly swallowed his pride, and subsequently asked Lugsdin for a tryout for the fall UPA series. “I spent all day thinking about that phone call, and what I was going to say.” The Altar Boys disbanded and thereafter entered the fold. Mike Grant, Kirk Savage, and Marc Seraglia went on to win the three WFDF World Ultimate and Guts Championships (taking the bronze in 2000) while playing for Furious George. Since then, the history that many of us know more familiarly has been laid bare for review on websites, blogs and even Wikipedia pages (perhaps straddling their notability criteria, but curiously still there, nevertheless). Over the years, Vancouver’s flagship open club has accumulated 3 world championships on behalf of Canada, 3 UPA (now USAU) titles, and 9 national titles. Hundreds of players from across the country and around the world have at some point strapped on cleats with Furious George.